Here is an attempt at an airplane some guy made. Don’t think it worked. Checkout the propellers- they look like feathers. This photo doesn’t do the feel of the place justice. that name probably doesn’t mean anything to you – it didn’t mean anything to me. But when I got there it was pretty amazing. In addition to the architecture and feel of the place and huge monument I. The middle of it, the stores around the entire square are the “Who’s Who” of jewelry and watches. Here’s the full list of all the brands: Repossi, Breguet, Dior, Lorenz Baumer, Buccellati, Patek Phillipe, Vhaumet, Fred, Jaeger-LeCoultre, Rolex, Dubail, Cartier, Louis Vutton, Chauret, Boucheron, VanCleef & Argels, Blanain, Mauboussin, Chanel, Piaget, Swatch, Hublot, Mikimoto. 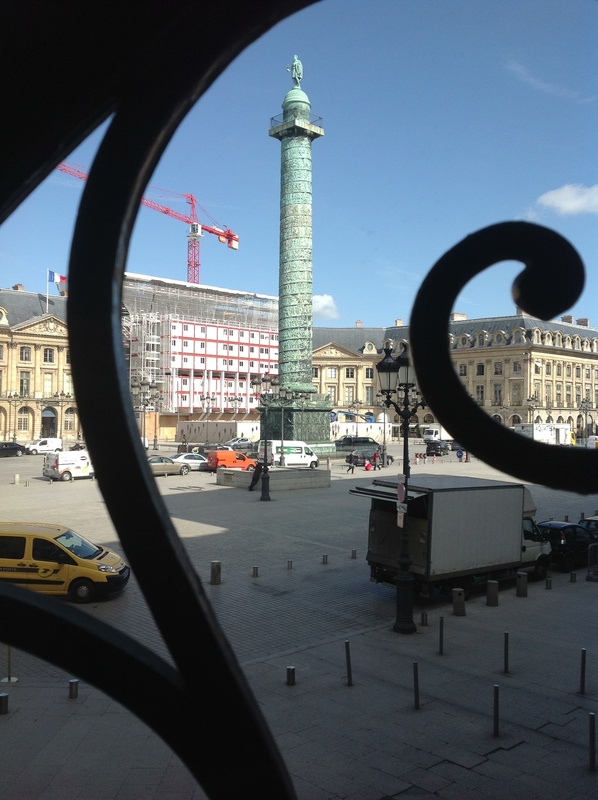 The place we went was the sales office of Charles Oudin – second floor of me of the other places. We looked at many watches and carriage clocks almost all a couple hundred years old. The weather is cooler today but still nice – actually a bit refreshing and not too hot like it would be in the summer. Sorry, I can’t finish this because it is past midnight and we have to get up at 6:00 to take a long bus ride. I will add more and photos to this later so come back and look at it again. I will just put in one photo for now. When I got off the train in Paris and found the taxis, there was a huge long line. As is common in many places like that there was a guy who came up to me asking if I wanted a taxi. I was not sure about some random guy offering his services and he told me that he had a motorcycle taxi. 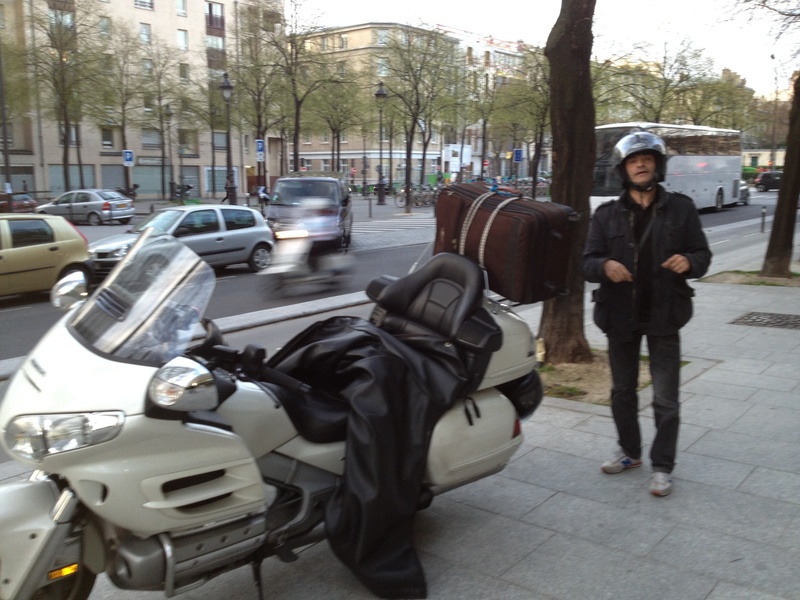 I said, “No way, you can get all my stuff on a motorcycle?” He said yes. I still was not sure but after talking about it for a while, I agreed. So we went to his big motorcycle – I don’t know motorcycles but it was like one of those big Hondas with the carrying cases on the sides, etc. After, a few tries moving things around, he did indeed get everything on the bike. I was really glad I went for it. Being a warm night it was very fun cruising thought the streets on this bike. Today (actually yesterday by the time i am getting to post this) was the day of trains. Four different trains with all the schlepping around with luggage in between. I had a nice English breakfast at the B&B after a somewhat restless night. Not sure if it was jet lag or excitement over the day. In any case, I found an apple store to see if they could replace my iPad but it would have taken a few days. So that was out. I put some tape over the edges to hopefully help keep it together for the duration. Then off to talk to a (real)estate agent. Interesting situation – not sure what to say about it. 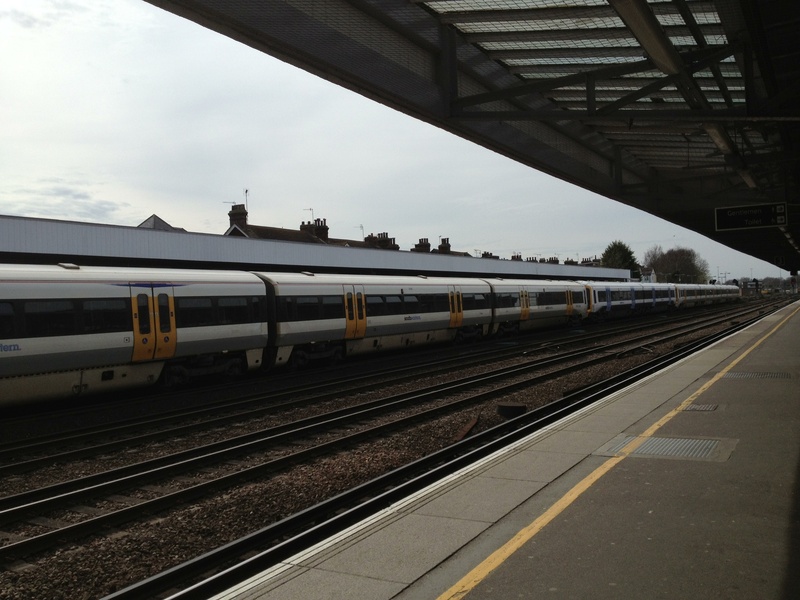 Then I drove to Gatwick airport to return the car and pick up the first of my trains. Got on the first train at Gatwick went for 7 mins, got off at Redhill. Changed platforms. Got on the 2nd train at Redhill went for 31 mins and got off at Tunbridge. Changed platforms. 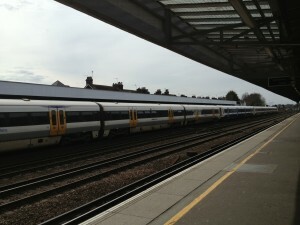 Got on the 3rd train at Tunbridge went for 37 mins and got off at Ashford. Changed platforms. 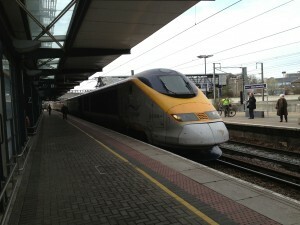 Got on the Eurostar at Ashford, went for two hours and got off at Paris Nord. This train goes under the English Channel and reaches speeds of nearly 200 mph. Got a taxi to the hotel. 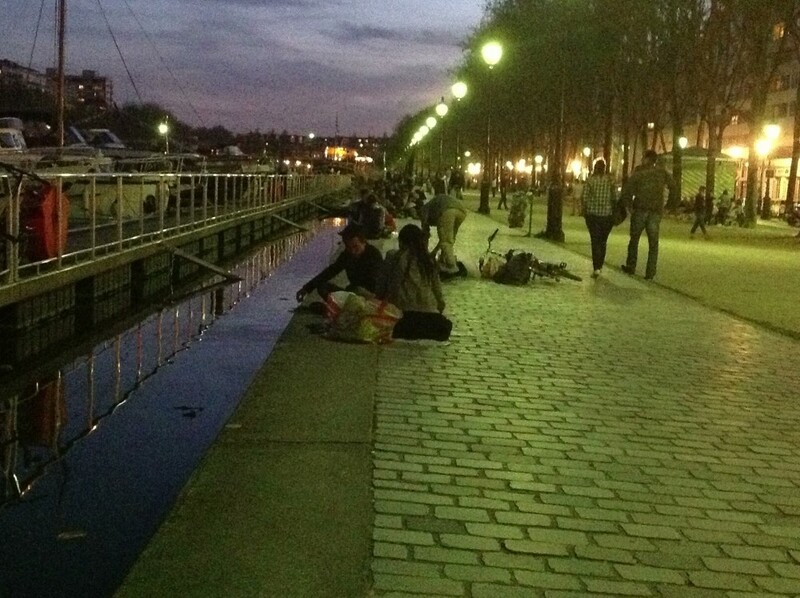 I couldn’t help but make that post last night on the weather in Paris – it was amazing – everybody was out enjoying it util late. 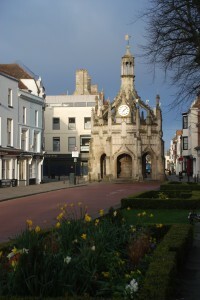 But I have not had time to put in my post about Chichester, the little town close to west Dean. So, here goes. Sorry the picture is not straight. but there is a round seat area in the center, looks like a place that people could wait out of the rain. And of course it has clocks on all four sides. 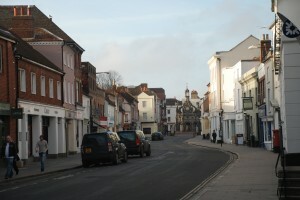 So back to the housing – it would be nice to be in town, but it is a fairly popular tourist town for the Brits. There are several festivals and artsy types of events going on throughout the year – good for some but parking and driving is a nightmare. So, while convenient to be in town from some perspectives, it is very inconvenient from others. I did learn about where the good places are and the bad places. you decipher the code, which I finally did just in time to turn in the car. You definitely do not want to own a large vehicle. I haven’t done my post for the day’s activities yet but I just got to Paris about an hour ago. Believe it or not the temp is 72 deg at 9:30 at night and everyone is out having a good time. 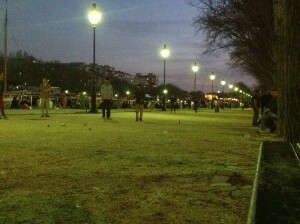 Lots of people jogging and the guys in one of the pictures are playing bocce ball. The hotel is next to a canal – boats are moored right next to where the bocce ball is happening. The color is kind of green in the photos because it is dark. I’ll sign off for now so that you can see these photos. Here’s a 360 degree panorama of the front of the West Dean College. Turn the volume up a bit, you can hear the sheep. You can also hear the wind. It was a bit chilly but not bad. Today, it as not about California dreamin but dreaming about the rest of my life. And not so much dreaming but pondering, investigating, and wondering about the future. Turns out that the decision as to whether I come here for school may be a lot more about what could happen after school than the actual schooling itself. 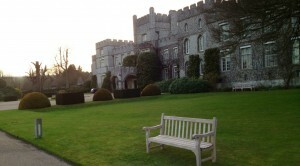 This school, West Dean Colleg, is an amazing opportunity. It would be a very intense year long course ending up with a Master’s degree in restoration/conservation of clocks. There is simply nowhere else in the world that does anything like this. I would do a significant degree of academic work as well as hands on and end up doing a paper on a research project. The lead instructor is a great guy, spent most of the day with him. We see life (actually clocks) in pretty much the same way. His interests and focus is very well aligned with mine. I won’t bore you with the details about that. I would also have exposure and contacts with several key people that specialize in particular skills, like gilding for example. London area is really a significant world center for clocks. After all this is where Greenwich is. So my day consisted of a lot of talking and questions about the school with the lead instructor. The students were not at school today because they are still on a two week Easter break. It was nice because it was quieter, low key, and the instructor was not too busy with other things – I felt like I had a lot of his personal attention. He gave me a small project to do- test my basic skills. I had to file a square on a round pin – the pin was about 3/8 in in diameter. Then I had to mark out and begin to cut out a clock wheel. Part of this was that the wheel needed to have a square hole in the center that fit the pin. It worked out OK – he said that I had the best skills he had seen of anyone that had come in for an interview to join the program, claiming to have some fabrication skills. So, that’s good. After lunch, I walked around the grounds a bit – really pretty – big fields right in front of the school with sheep enjoying their lunch. 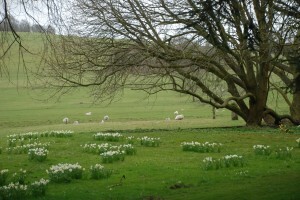 Daffodils are coming up in the “lawn” – looks very cool. And the weather was a little cool as well. The sun has peeked out from time to time but the wind was crisp. Didn’t damp my spirits however. There are also very nice gardens in the property, both vegetable and otherwise. Much of the food we ate was grown on the property. This is a 6400 acre estate! I will try to figure out how to make a photo gallery so that if you are interested, you can look at a few more photos. I took a 360 degree movie out in front of the school as well. If it works out, you might be able to hear some sheep baaing. We’ll see about that. 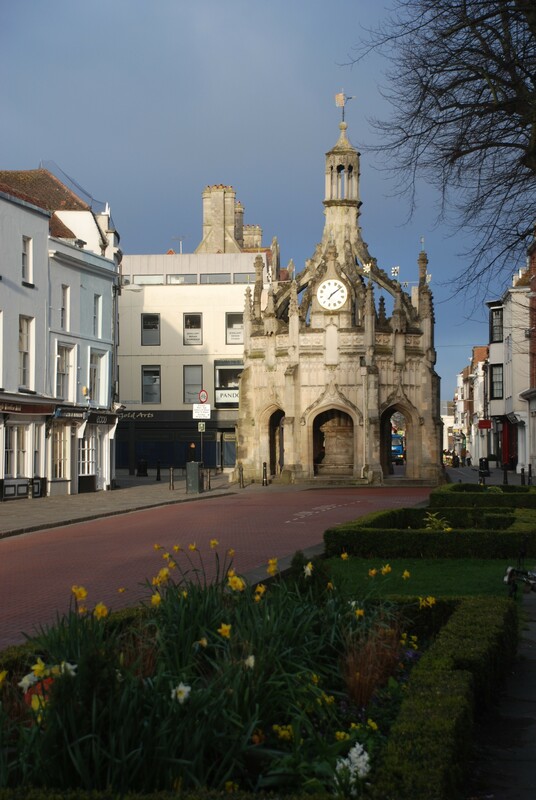 So tonite I am staying at a B&B in Chichester, a small town about 15 min south of the school. This is an old town that had a wall built all the way around it. Quite a bit of the wall still exists but the town has spilt over the walls by several blocks. Still small enough to walk around in about 45 minutes. 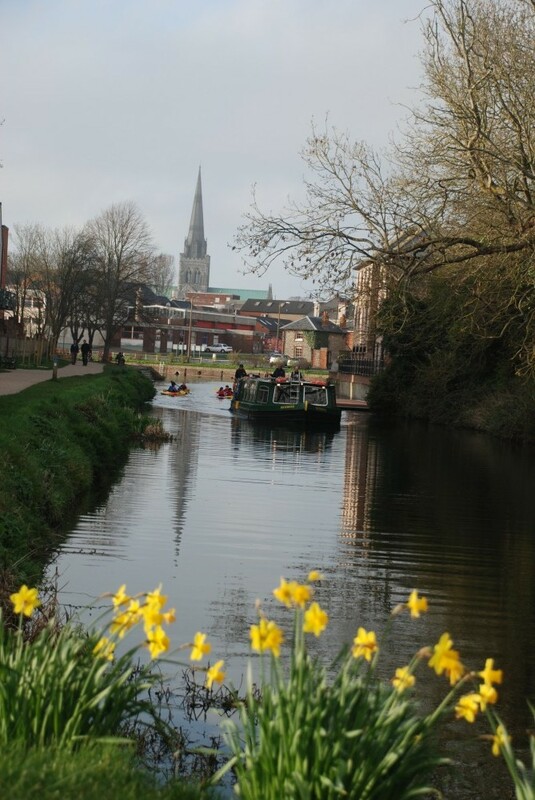 Of course, even for a small town, there is this huge cathedral in the middle of town – a still operating church. The church building is in pretty decent shape but the unattached bell tower is not doing so well – still holding up the bells which are still rung on a regular basis – twice a week. Bell ringing, for those that don’t know, is a pretty big deal over here. And you thought clocks were obscure! Had a very nice dinner at a place in the center of town called Bill’s. I guess I wasn’t up for the pub experience tonight. I did have the fish and chips though – not bad! Hey all you eager people that want to comment on my blog – now you can! The aging, not very hip 60 year old figured out how to fix it, – and then I actually fixed it too. So comment away! Have fun. On a not so good note – this evening, whilst walking the streets of Chichester, I dropped my iPad. Yikes! But it still works with a very cracked up glass. I am sending this out now so that, if you don’t hear anything more from me, it is probably not because I dropped off the face of the earth or that I went rogue and decided to never come home – it will be because the iPad gave in to the torture of world travel. That’s all for this post. I’ll talk more about my day in another post. My first very long day is over and I am ready to try to get some sleep. I left Santa Barbara at 1:25 pm then hopped through LAX and Dallas before the 9 hour flight to London. We arrived London just about on time with no difficulties getting my bag or getting through customs. On the approach into London we flew right over downtown – I was able to see the parliament buildings, Westminster Abbey, and of course, Big Ben. The photos I got aren’t worth showing because I was peeking through clouds – a bit dreary looking but fun to see anyway. I got a rental car and drove to Reading just a half hour west. 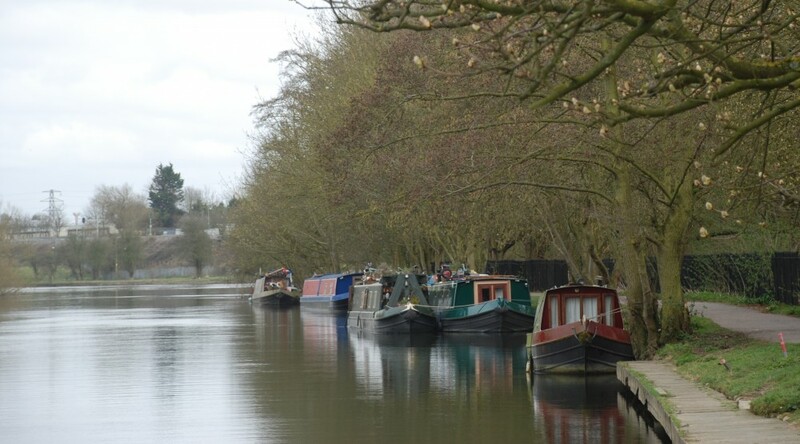 Visiting my nephew Tim, his wife Ali and their 16 month old, Jessica, was nice but my family knows about my obsession with “The Thames”. They live practically on the Thames, so a short walk and there we were – as magnificent as ever! I only had time for a short visit then had to push on southward to West Dean College – the purpose for my stop here in England. Although I have driven here before, it was just as much a challenge- remembering to stay on the left and the country roads are so narrow! A couple times I hit the curb or shoulder on the left side just to be sure I wasn’t going to get side swiped by drivers passing on the other side of the road. Thank goodness for GPS though. I did not make one wrong turn but would have were I relying on trying to find road signs indicating the direction I should go. Arrived at the College exactly on my expected schedule – 7:30 pm. This place is amazing! I am not allowed to take pictures inside but it is full of old tapestries and paintings in the huge hallways. It’s heyday was around 1900. Edward James, who created the Foundation that the place survives on was good buddies with Salvador Dali. That gives you a bit of a feel for the kind of things the guy was into. 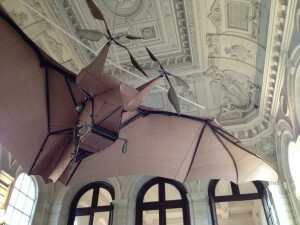 It is a strange combination of old, almost medieval feel combined with a new surreal, artsy feel. I am staying in one of the, about 100, rooms – hotel like. I think some of the full time students live here. It’s the on-campus “dorm.” Old creaky floors, doors with old style keys, huge stairways, big fireplace, clean rooms but not fancy. Tomorrow I interview as a candidate for the school – not really sure what to expect it I am told is is somewhat informal. And then it is on to a B&B in Chichestser, a small town nearby, for the night.